I am apparently on a blanket roll and decided to work on designing a baby blanket. Instead of recreating the River Rock blanket in a smaller format, I changed it up a bit, and I have to say I was able to make it with 2 Caron Cakes, including 3 rows of edging. 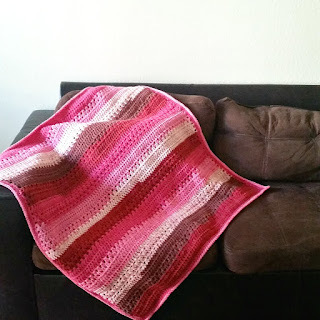 I crochet loose and use a big hook, but I think for those who have 2 cakes can now add this one to their project pile. This blanket measures approximately 40x36 inches. Edit to update the instructions. I am seeing that some folks are not getting the instructions and someone emailed me about it. I am adding my response. I hope this helps with what I mean add 2 dc at the last stitch. Let me know in the comments if you still need clarification. "with row 4, you are not counting the stitch/space where you did the ch 3 before turning, so you are skipping the next stitch after that. Doing this will have you end with 2 dc in the top of the ch3 stitch from the previous row. For row 5, again not counting the beg stitch where you did the dc from the previous row (remember you have 2 dc in that last stitch), you are going to skip those 2 dc actually dc in between the two dc clusters. So you’re skipping a 2 dc, as there is a natural space left from the 2 dc’s from the previous row. Doing this will have you ending up with 2 dc in last stitch. Row 6 is just repeating row 4 at the begging and row 5 with 2 dc in between 2 dc’s from the previous row." With J Hook, chain 93. Row 4 *Skip a stitch, 2 dc in next stitch, repeat from * across. End with 2 dc in last stitch. Ch 3, turn. Row 5 2 dc in each space left from previous row, ending with 2 dc in last stitch. Ch 3, turn. Row 6 *Skip a stitch, 2 dc in next stitch, repeat from * across. End with 2 dc in last stitch. Ch 3, turn. Row 10 Skip the next stitch (since ch 3 counts as a dc) dc in next stitch, then dc back in skipped stitch. Repeat to end. Ch 3, turn. Row 11 Skip the next stitch, dc in next stitch, then dc back in skipped stitch. Repeat to end. Ch 3, turn. Row 12 Skip the next stitch (since ch 3 counts as a dc) dc in next stitch, then dc back in skipped stitch. Repeat to end. Ch 3, turn. Row 16 *Skip a stitch, 2 dc in next stitch, repeat from * across. End with 2 dc in last stitch. Ch 3, turn. Row 17 2 dc in each space left from previous row, ending with 2 dc in last stitch. Ch 3, turn. Row 18 *Skip a stitch, 2 dc in next stitch, repeat from * across. End with 2 dc in last stitch. Ch 3, turn. Repeat the pattern repeat (Rows 10 - 21) for your desired length, and end with rows 16-21 for a total of 58 rows. Now this part is optional, you either add the edging or not. But if you want to continue with the edge, without cutting the yarn, ch 1, then 2 sc in each space on the side of the of the blanket until you get to the first corner. Do 4 sc in the corner then sc in each stitch on the bottom of the blanket until the next corner. Do 4 sc in the corner, then 2 sc in each space on the side of the blanket until the next corner. Do 4 sc in the corner, then sc in each stitch across until the next corner. Do 4 sc in the corner, and then sl st in the ch 1. Just sc in each stitch across until you get to the corner. You will do 2 sc in one sc, then 2 sc in the next sc for your corner. Just repeat this until you have 3 rounds of edging. This is optional and more of a recipe so use if you want.